I like the shell drill to teach and rehearse most of the movements we have to defend. 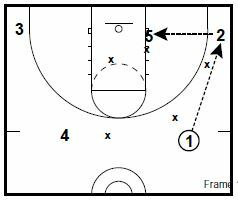 These two drills are ways that you might experiment with on defending the post in your shell. 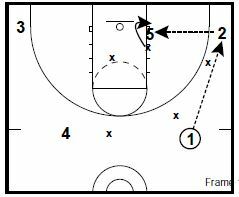 If they fit your defensive objectives in that drill, you can experiment with them 5 on 5 in practice before deciding whether or not they are something that will be effective in a game. 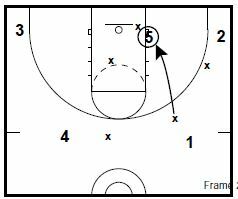 These defensive drills are from a collection put together by Nate Hill, Assistant Boys Coach at Colonel Crawford High School in North Robinson Ohio. He has coached for 18 years from 7th grade through Varsity Head Coach. LA is when the ball is entered and you choose one man to double the post. It is the worst offensive player or the PG. This is called in practice and games. If 1 is worst offensive player, we double team the post with his man. The double-teamer must have his hands high and make the post use his arms to throw a weak pass. 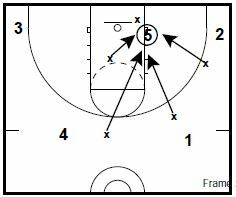 Bob Hurley uses different calls out of his shell defense. Duke is when the ball is entered and all 5 guys collapse with their hands raised around post, then return to their man. All 5 players collapse on the ball with their hands up, making the big man throw the ball out using all arms. Look for bad pass, and steals or tips. Used 2 – 3 times a game to stop big men.